Jeanette Estes, 83, of Holly Pond, passed away Friday, March 1, 2019. She was born Nov. 2, 1935, to Odie J. and Hester Gorham Sweatmon. Mrs. Estes enjoyed attending the Senior Citizens Center where she loved to play Rook with her friends. Jeanette attended and enjoyed Camp Bluebird of Alabama as a cancer survivor for many years. In 1954, she married the love of her life, Feltus Estes, and began a family. Jeanette’s children, grandchildren, and great-grandchildren were her treasures on earth. Her heart was her family and she will be missed greatly by her family and friends. 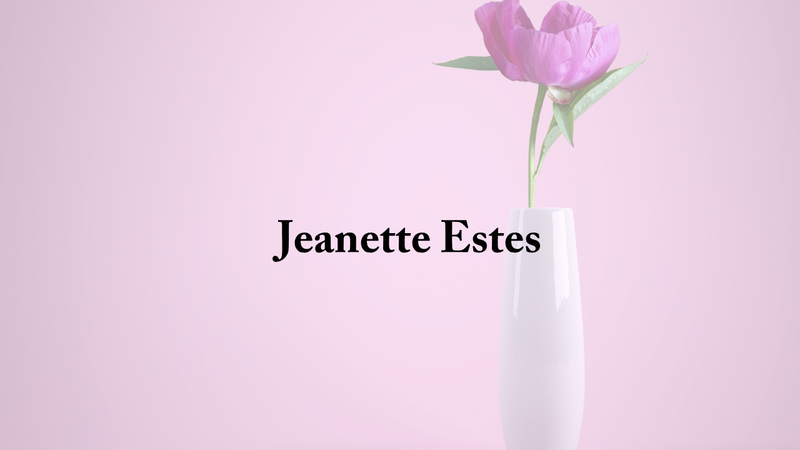 Jeanette is preceded in death by her parents, Odie and Hester Sweatmon; her beloved husband of 36 years, Feltus Estes; daughter, Joyce Shaddix; brother, Edward Sweatmon; and sister, Lavonda Blackwell. She is survived by her son, Donald (Vanessa) Estes; son-in-law, Danny Shaddix; brother, Junior Sweatmon; sisters, Faye (Harry) Owens, Gaye (Winton) Cannington; grandchildren, Jeremy Shaddix, Scotty Estes, Angela Jones, Skipper Estes, Kayla James; and eight great-grandchildren. Funeral services for Mrs. Estes will be 1 p.m. Monday, March 4, 2019, in the Holly Pond Funeral Home Chapel, J. Wesley Jones, Jr. officiating. Jeanette will lie in state from 12 noon until services begin at 1 p.m. Burial will follow in Brooklyn Cemetery. Friends may visit with the family on Sunday, March 3, 2019, from 6 p.m. until 8 p.m. at the funeral home. Holly Pond Funeral Home is honored to serve the Estes family.